The bath that feels like a massage!!! 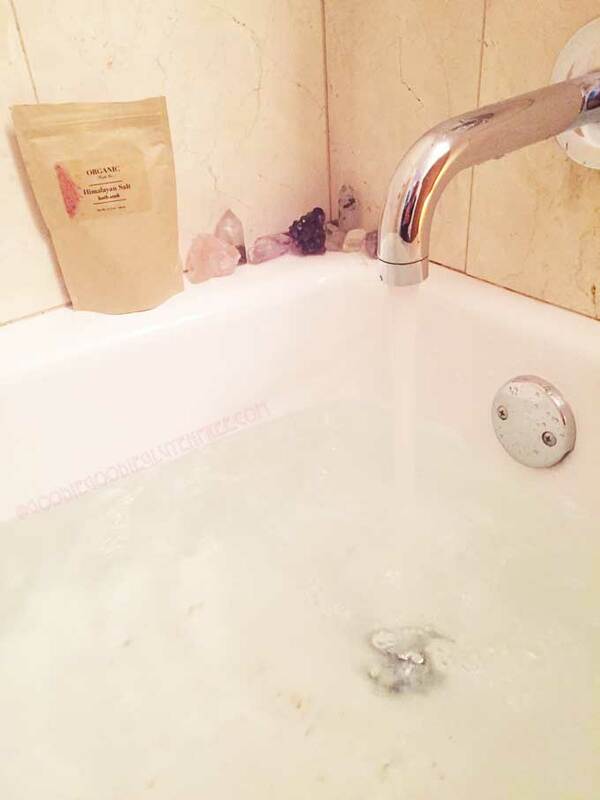 I swear no joke is an Epsom salt body bath soak with Himalayan pink salt. It’s really simple and it’s one of the best self-care baths you can do for your body because it naturally relaxes your muscles. There’s Magnesium Sulfate in the Epsom Salts which naturally relaxes your muscles (do not eat this). It’s also the BEST to do at night because it makes you so sleepy and relaxed. When you get out of that tub you are going to feel like you just had a massage! Like you just walked out of the yoga studio feeling all Gumby, relaxed and good. Especially after you do your evening plans and finally get into bed. Your body is going to feel light as a feather. Massage vibes. Post yoga vibes. Another thing you need to know is that I also love to add Himalayan pink salt to the mix. It’s a total plus for this bath soak. Himalayan pink salt has well over 80 minerals your body needs to absorb. A warm bath is a beautiful way to absorb those minerals and allow your body to relax and unwind from the day. 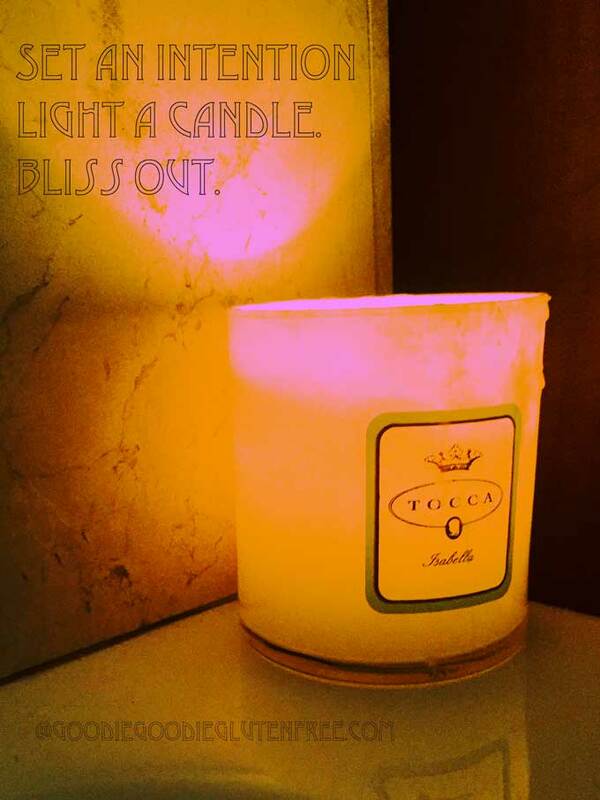 Before the bath, I like to light my favorite candle, bring it into the bath and then set an intention for the evening. 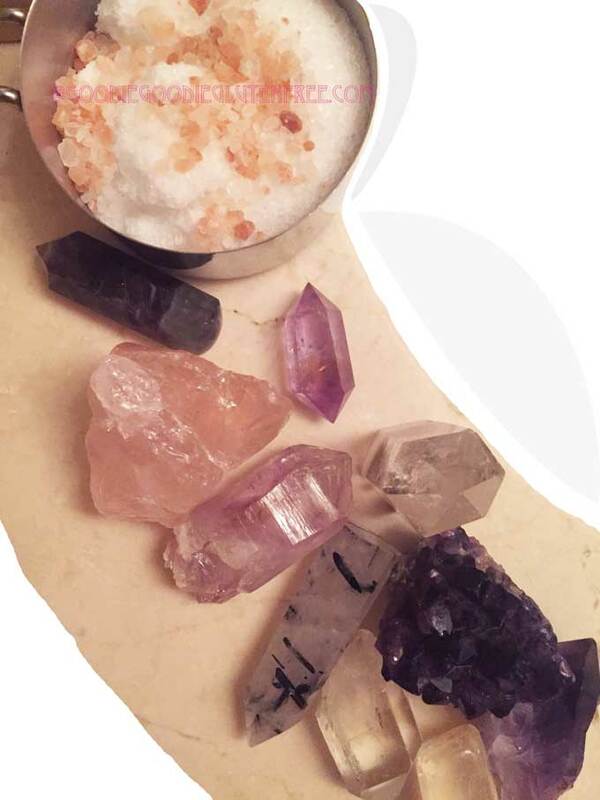 I lay out all of the crystals I want to bring into the bath with me(for the energy of course). I line them up around the bath and around the sink. It doesn’t matter where you put them as long as you bring their energy in. It doesn’t even have to be a ton of crystals. If you are a newbie, just bring one into the room. New to crystals? It’s about your intention, not how many you are bringing in. An intention can be written or thought. It can be a positive affirmation, a positive quote, an angel card, a tarot card, an oracle card, and it can also be kind words. If this feels too woo-woo for you, no sweat – start with one kind word or one word that describes healing, in fact, you can even use the word healing. 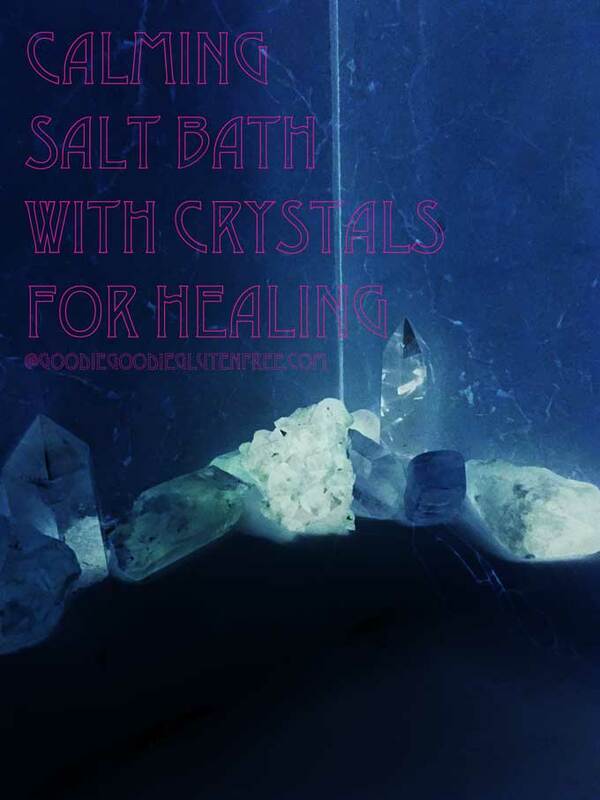 Between the salts, the crystals and the positive affirmations you can imagine how much energy it is that you are bringing into this bath with you. So that means this bath also detoxes your body, the same way you would detox from the gym which is a good thing when you are in healing and trying to maintain your wellbeing. This is also the most relaxing bath ever and has the BEST benefits. This soak is not just for your feet, even though it does wonders for aching feet. It does wonders for your aching body too! But it also helps so much for sleep, relaxation, mindset, aches, and pains. Sometimes I get obsessed with these baths and do them every night before bed to prepare for sleep, and other times I do them twice a month. It’s all good as long as you are sweating in this bath and using warm, not hot water. If you start to sweat during the bath you’ll know it’s working. Ready to dip into this soothing bath, like STAT? Your favorite smelly candle. This is my latest fav! Fill the bath with warm water. Halfway through, add Epsom salts and Himalayan pink salt. Halfway through, light your favorite smelly candle and bring it into the bathroom. You are creating a soothing ambiance. Halfway through, set your positive intention. Write it down or chant it in your mind – honestly writing it down is much easier. Halfway through bring your favorite crystals or crystals you want to use into the bathroom and place them where you desire, and not in the water. You’ll want to keep them dry. This is where you’ll bring in your favorite tunes, Netflix, magazine or book of choice to help the time go by. Once the tub is filled, turn the water off and get in. Soak your body for 15 minutes minimum. And if 15 minutes is all you can do, do that. Sometimes I feel like I don’t have the time for this ritual because life gets in the way. So I set my oven timer for 15 minutes and bring ONE magazine into the bath so I can read up on the latest trends or celeb gossip while I soak or I bring music in. Anything I want to listen to. So if this is you, bring in your favorite tunes, book, magazine and even Netflix (but don’t put Netflix in the tub!) and multi-task so you can at least get this ritual in no matter what. If I seem bossy it’s because I mean serious business and I know what I’m talking about. This has seriously helped me and my body SOO much! I hope you seriously enjoy this beautiful ritual.